Have you ever wondered what the first drawing by a human look like? 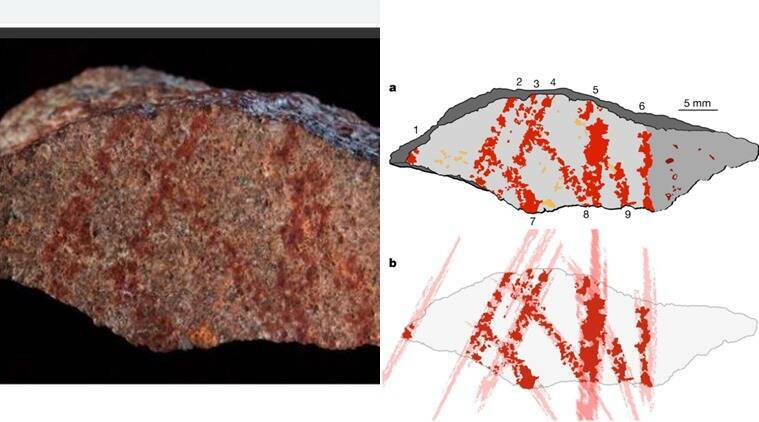 A new study published in the journal Nature carries information about the earliest known drawing in human history – a red, cross-hatched pattern that looks somewhat like a series of hashtags stitched together. This drawing dates back to 73,000 years old and predates previously discovered abstract and figurative drawings by at least 30,000 years, according to the study. The cross-hatched pattern drawn in ochre had been buried till now in Blombos Cave, near the southern tip of South Africa, east of Cape Town. It’s a site that contains some of the earliest known evidence of modern human cultural activity. Scientists believe that a human intentionally and deliberately drew the lines on a small rock fragment known as a flake. The researchers concluded with the help of microscopical and chemical analysis that a red ochre pigment was intentionally applied to the flake with an ochre ‘crayon’. Based on experiments recreating the pattern, the authors concluded that the “crayon” had a tip about 1 to 3 millimeters in width. It is not surprising that red ochre was found as a pigment in the drawing. “The mineral, largely consisting of iron oxide, has been used as a pigment since time immemorial,” the report said. But then it also adds that since the early Homo sapiens were able to produce such designs, it indicates they might possess relatively “modern” cognition and behaviour – which makes us wonder – was it really hashtags they drew?